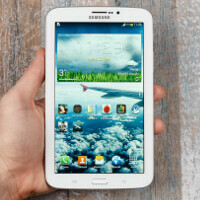 Good news for you, users of Sprint's Samsung Galaxy Tab 3 7.0 (SM-T217S)! It seems that Samsung and Sprint have finally started the OTA rollout of Android 4.4.2 KitKat for your tablets, which is, in fact, the first major update for the slate in question. Just as one would expect, this firmware update brings most of the improvements and goodies that KitKat has in tow. Rolling under the T217SVPUBNE7 moniker, the sweetish update brings most of the performance and visual improvements that KitKat has in tow. Apart from being treated to better performance, Sprint's Galaxy Tab 3 7.0 also receives a number of interface tweaks and features. Among the most notable ones are the overhauled status and navigation bars, which are now transparent, the redesigned status bar icons, and the revamped lock screen layout, which gives you quick access to the camera. The firmware update has just started its rollout, so be advised that you may not get it right away. Still, if you are impatient, you can manually check and see if KitKat is available for you Galaxy Tab 3 7.0. Hopefully, your tablet will get a taste of Android 4.4.2 soon. Samsung understand updating today models are the best marketing tool for tomorrow models.